Bowker Insurance Group continues their community enrichment by introducing a new charity campaign benefitting Cornerstone Schools, an award-winning learning facility which provides tuition assistance for those in need. Cornerstone stresses educational excellence in a nurturing environment, guiding local children toward more promising and productive futures. Bowker Insurance Group announces a collaboration with Cornerstone Schools as the latest campaign in their ongoing community enrichment program. Many families believe that an outstanding education is beyond their means; however Cornerstone offers tuition assistance so that all children may have access to a more promising career path and brighter future. Readers who would like to help better the local community, one child at a time, may do so now at: https://www.crowdrise.com/a-step-in-the-right-direction-towards-outstanding-education. 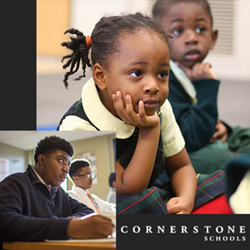 Recently named the #1 school in Detroit, Cornerstone Schools has been providing high-quality academics to area children for 25 years. Operating from a safe and beautiful 18-acre campus, Cornerstone offers a curriculum which includes the arts, an award-winning music program, sports and foreign languages. By cultivating close relationships and unparalleled opportunities for students, they seek to transform kids’ lives and graduate classes of well-educated, productive, responsible citizens. Community support allows this excellent school to expand their footprint by offering tuition assistance to all students grades K-12 who hunger for an exceptional education. Bowker Insurance has made it simple and affordable for everyone in the community to show support for this worthy cause by pledging to donate $10 to Cornerstone Schools for each person recommended to the agency for a quote, with no purchase necessary. Readers may visit the campaign’s webpage to recommend a friend and/or make a personal donation here. From their offices in Livonia, Canton and Plymouth, Bowker Insurance Group has fired up social media, email and text message communications to help spread the word, and has also dedicated a full page of their monthly magazine to feature all the details of the campaign. The electronic version of Our Hometown magazine, which is delivered to thousands of households in metro Detroit, may be viewed at: http://www.bowkerinsurancegroup.com/Our-Hometown-Magazine_41. The caring team at Bowker Insurance Group has made an ongoing commitment to operate as Agents of Change in the community and invites community members to submit information on people or groups to be considered for future initiatives through this link: http://www.bowkerinsurancegroup.com/Add-Community-Cause_47. For future reference, or to view past campaigns, readers are encouraged to bookmark: http://www.bowkerinsurancegroup.com/community-cause. Serving the families of western Detroit from offices in Livonia, Canton and Plymouth, Bower Insurance Group has a simple mission: to provide the finest insurance and financial products in the industry, while rendering consistently superior service to the community. Cheryl Bowker and her team of caring professionals believe in protecting all the things which are most important to their clients (their families, homes, cars and more), and in helping to prepare long-term strategies to enable financial success. The dedicated experts at Bowker Insurance Group may be reached at 734-525-9610 (Livonia) 734-738-0300 (Canton) and 734-456-6066 (Plymouth). More information on the agency may be found at: http://www.bowkerinsurancegroup.com/.